Making photos pop by adjusting the lighting afterwards on the iPad – Free, today only! 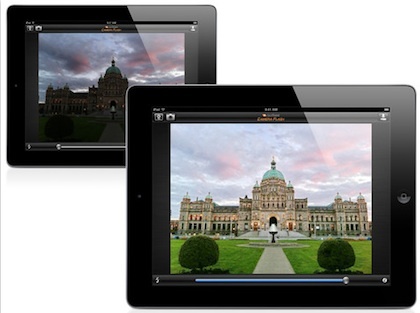 We have the full range of photo enhancing apps on our iPads. The reality is, most photos don’t need a lot of work to enjoy, they just need some adjustments made to their lighting. The change you need is to go back to where the photo was taken and use a really BIG flash so you can have the detail you have now, but all the dark areas will be viewable too. Those photos you took of buildings or people standing on the beach or in a darker room or down at the lake… yup, just about any photo has hidden spots. Generally, within the better photo enhancement apps, there is tools like Clarify in Camera+. If you would rather launch an app where that tool is just one of a long list, you may want to grab a copy of the Universal app ACDSee Camera Flash. Grab fast though, the developer chose today as a one day special FREE offer. ACDSee Camera Flash has a button to clean up the dark areas of a photo, and that is about it. You actually can adjust the amount of the clean up that is applied, but for the most part, the app just does the one thing… very well! The percent of cleanup slider is nice since some photos loose some of the brighter areas when you bring up the darker areas to be viewable. Just tune the enhancement impact till you get a nice mix. Imagine, the power of a super bright flash, without the usual big shadows!